Our Head of Risk Duncan Tebb spoke to the AFR last week about our response to the Federal Government's plans to implement a new regulatory framework for Initial Coin Offerings (ICOs). One of Independent Reserve's key recommendations include amending the existing regime by providing carve outs for certain token classifications. We believe steps like this could encourage more promising start-ups and talented entrepreneurs to stay in Australia and invigorate the local economy. See here for Independent Reserve's full response. The ADC Global Blockchain Summit is also happening in Adelaide this week. A fair representation from state and federal governments, we will be keeping a close watch on news relating to ICO regulation and future commitment. Cboe Futures Exchange has put its Bitcoin futures market on hold, citing a need to reassess how it plans to offer digital asset derivatives. The move isn't a total surprise given Cboe's volume has been around four times lower than rival Chicago futures exchange CME Group. Multinational tech conglomerate Cisco has released a report that predicts 10% of the world's GDP will be stored on blockchain by 2027. Ethereum co-founder Joseph Lubin, thinks that's WAY too pessimistic though ... At the SXSW conference this week he said he expects blockchain to underpin the "majority" of economy over that same time period. “When the blockchain fully ramifies and in 10-20 years the economy will probably be 10x as large. The blockchain will probably be the majority part of that,” he said. Fresh doubts have emerged over stablecoin USDT Tether's 1:1 backing with US dollars after it updated its website from “always backed 1-to-1 with traditional currency" to being backed by "reserves" including “cash equivalents,” “other assets” and “receivables” that it was given in exchange for loans delivered to “affiliated entities.” BTC prices tend to benefit when doubts are raised over Tether's legitimacy. In other stablecoin news, six global banks have signed letters of intent to issue stablecoins backed by their national fiat currencies on IBM’s blockchain-powered payments network, 'World Wire.' The end result may be incrementally faster bank transfers between select counterparties but let’s not confuse this as banks embracing decentralised, immutable cryptocurrencies. The number of Bitcoin wallet users tracked by Blockchain.com has topped 34 million, surging almost 50% from 23.6 million users a year ago. In a separate report, the number of crypto ATMs worldwide increased over February from 4291 to 4387 according to CoinATMRadar. Blockchain in gaming seems like the hot new frontier. Late last year Tron announced a $100 million gaming fund and in-game crypto Enjin has been on a tear over the past month, shooting up around 450%. Ripple this week announced it will launch its own $100 million fund in collaboration with San Francisco startup Forte to better integrate blockchain with in-game markets. The fund will target game economies with more than 50,000 daily users and assist devs to use blockchain to increase users and monetization. Although it's not directly tied to payments, it could be a big deal if game manufacturers get on board with Ripple's Interledger Protocol and XRP token. 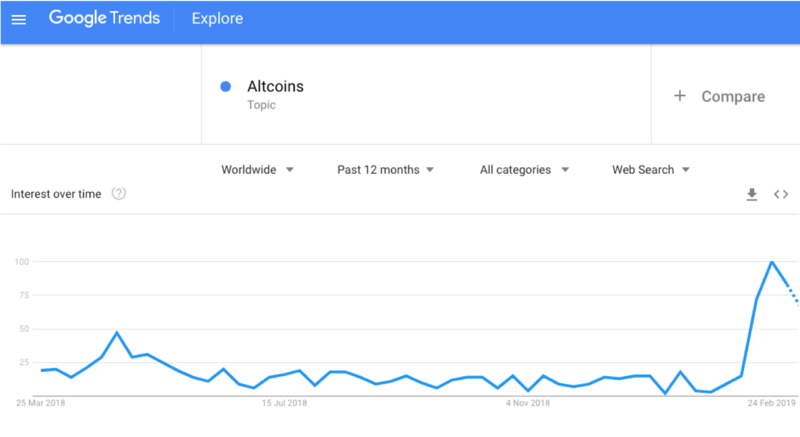 Searches under the topic 'altcoins' are approaching levels not seen since the crypto market's All Time High, according to Google Trends. A topic is different to a search term, in that it aggregates similar searches under one heading - so 'altcoins' covers searches for XRP, Litecoin, Binance Coin etc. Interest has spiked as pundits point to a sea of green as evidence 'altseason' is back. If you are looking some for bullish sound bites, Marc Faber aka Dr Doom has reportedly bought Bitcoin because it could become the standard for money transfers. Combined with the altcoin pumps, the increased searches for Altcoin, the influx of OTC buy orders we have seen this past week, this feels like a turning point in the market. Let’s wait and see.